Today I am delighted to publish this guest post from ace food eater and writer Kake, who has been writing a series on London Road, Croydon which you can enjoy here. The link to this post is here. While trawling through the archives at the Croydon Local Studies Library recently, I made a delightful discovery that immediately brought the Vintage Cookbook Trials to mind. I had actually been looking for information on Jay’s Furnishing Stores, a chain of hire-purchase furniture shops that operated in the UK during the 20th century — but to my surprise, nestled among the cuttings of newspaper adverts offering “guaranteed delivery” and “the Best Terms in the World” was a small booklet entitled “20 Ways of Cooking Fish”. Published by Jay’s at an unspecified date (though an anonymous hand has written “prob 1932” on the back), this booklet contains recipes written by a Monsieur X M Boulestin, billed as “The Worlds [sic] Greatest Cookery Expert”. [Editor’s note: He definitely knew what to do with potatoes.] The rather tenuous connection between furniture sales and fish is supported by a short statement on the front cover: “Our object has always been a double one – to supply the Best Value in Fine Furniture and to ensure a Happy Home to each of our customers – by freedom from worry – Every housewife knows what part cooking plays in making a happy home. Flipping through the recipes, I was briefly tempted by Cod Normande (featuring cider, parsley, shallots, and mushrooms) and Skate with Caper Sauce (which involves cooking the skate along with some of its liver plus cloves, parsley, thyme, bay leaves, and vinegar). However I thought the cod dish might be a bit boring, and I wasn’t sure if I’d be able to get skate liver; indeed, I hadn’t previously known they even had livers. So I eventually settled on Eels Landaises, a lightly stewed dish of eels with red wine and prunes. The author states that this recipe comes from “the Landes”, which Wikipedia tells me might refer to several places in France, but I suspect the most likely is the département of Landes itself, particularly as Wikipedia also tells me that M Boulestin had his own holiday home there. I found some interesting pages online while investigating further: Landais Folklore discusses the customs and geography of the area, and Landais Gastronomy discusses the food, mentioning eels among other things. First, let us praise the author for not ****ing about regarding the title of this book. 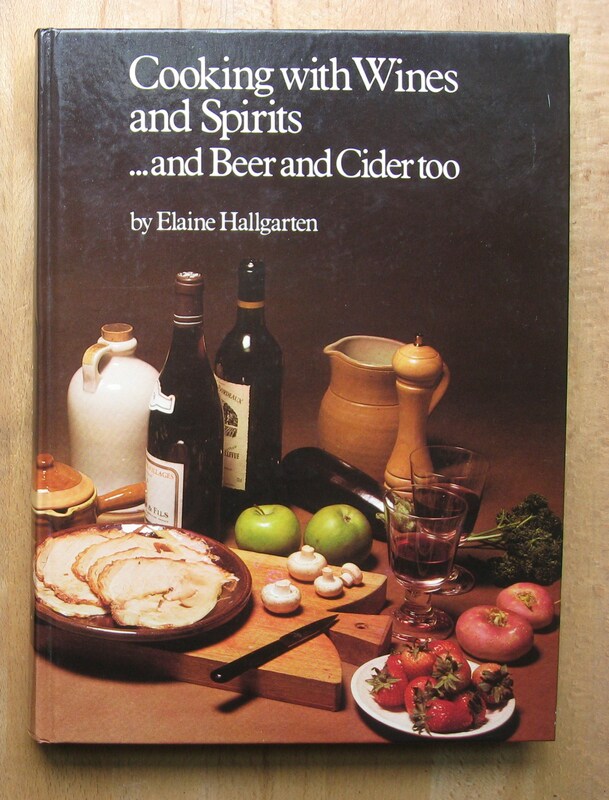 Ms Elaine Hallgarten, freelance food and travel writer, is the creator of and contributor to many works, including the Jaffa Cookbook, Mince Matters, Cookery Do, The Yoghurt Cookbook, Gourmet’s Guide to London (1992 ed) and Reminiscences and Recipes of the Bakharian Jews of Samarkand. I’m not mocking her oeuvre – someone on Amazon has called Mince Matters an ‘excellent practical cookbook‘, something many, many cookbook writers fail to achieve (I should know).